Today marks the 200th anniversary of the birth of one of the most well-loved storytellers of all time - Charles Dickens. 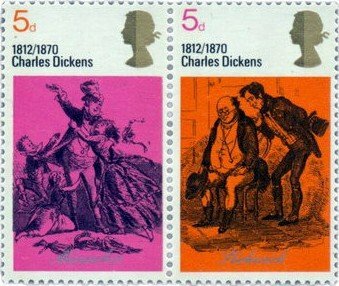 The great 19th century English novelist and outspoken supporter of social reform will be remembered in a new set of British stamps to be issued by the Royal Mail in June this year featuring famous characters from some of his novels, including Oliver Twist, David Copperfield and A Tale Of Two Cities. This is not the first time that characters from his books have been featured on British stamps – on 3 June 1970 four stamps were issued to commemorate the centenary of his death. 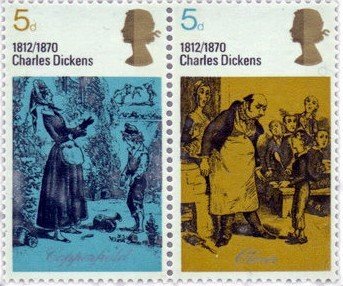 The four 5d Dickens stamps pictured Mr. and Mrs. Micawber (David Copperfield); Mr. Pickwick and Sam (The Pickwick Papers); David Copperfield and Betsy Trotwood (David Copperfield); and of course, a scene showing Oliver asking for more (Oliver Twist). 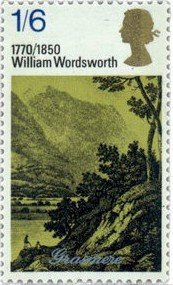 The four stamps in the 1970 Charles Dickens Commemorative Set were issued alongside a single William Wordsworth stamp, which marked the 200th anniversary of the poet's birth and depicted Grasmere, home of the Lake Poets. Curiously, Britain was not the first country to issue a commemorative stamp celebrating Charles Dickens. That honour goes to Russia, or the Soviet Union as it was then called, which marked the 150th anniversary of his birth in 1962.